The Firestone family is celebrating a homecoming: 1st Lt. Nick Firestone has just returned from a year-long deployment in Afghanistan. 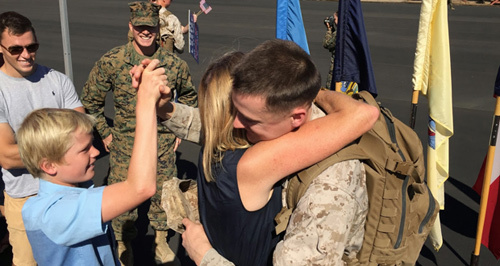 The 26-year-old Marine arrived home in the Santa Ynez Valley on November 8th. This was the second deployment for the young member of the well-known Santa Barbara County family, who ended his first tour, in the South Pacific, early last year. And he should. Adam Firestone is, himself, a former Marine, having joined in 1984. He was promoted to Captain in 1988, ahead of his deployment to the Persian Gulf, and ended his service in 1991. Mr. Firestone, 52, son of Kate and former 35th District State Assemblyman Brooks Firestone, has since gone on to spearhead the family’s business ventures in wine grape growing and craft beer making. The Firestones’ connection to the U.S. Marines has, in fact, inspired one of their ongoing winemaking ventures: the Jarhead label. Our thanks go out to Gabe for his support of Jarhead Wine Company. Click here to read the rest of his story on Jarhead.